Be the first to share your favorite memory, photo or story of Clydie . This memorial page is dedicated for family, friends and future generations to celebrate the life of their loved one. Clydie Mae Hughes, 83 of Freeport, Illinois, beloved wife of Sammie Lee Hughes, mother, grandmother, was called to her heavenly home on Tuesday, January 22, 2019 from Presence St. Joseph Nursing Center. She was the daughter of the late Clyde and Lottie Mae Veasley. Born on February 2, 1935 in Durant, Mississippi. Clydie was employed at Structo in Freeport for several years before going to Micro Switch where she retired after many years of services. Clydie confessed Christ as her personal Savior and was a member of Mt. Carmel Missionary Baptist Church, Freeport, under the leadership of Pastor Tommie L. Robinson, and later under the leadership of Pastor Charles Threadgill, Jr., she served faithfully as President of the Culinary Ministry, on the Nurses Health Unit and on the Mother’s Board. Clydie loved spending time with her family, was a dynamic cook and always enjoyed passing on her special recipes to her daughters, daughter-in-laws and many nieces. Some of her favorite hobbies were fishing, bowling and shopping. Sammie Lee Hughes, (3) sons: James (Sedalia) Hughes, Jeffrey (Carolyn) Hughes, Marshall (Pamela) Hughes, all of Freeport, IL, (2) daughters: Brenda (Allen) Gray of Kankakee, IL and Jeanine Hughes of Freeport, IL. ; (11) grandchildren, Jamero A. Hughes, Lendell McClain, Marcy Jones, Kristina Hughes, Christopher Hughes, Chase Euell, Triana Hughes, Marshall Hughes, Jr., Milan Hughes, Jaylon Hughes, Chanlon Hughes, Jarren Hughes; (13) great-grandchildren and (1) great-great grandchild. (2) sister in-laws VeElla Hughes and Alee Veasley. 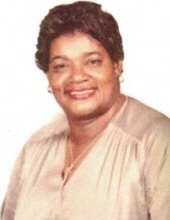 a special cousin, Everett Veasley, Jr.
To send flowers or a remembrance gift to the family of Clydie Mae Hughes, please visit our Tribute Store. "Email Address" would like to share the life celebration of Clydie Mae Hughes. Click on the "link" to go to share a favorite memory or leave a condolence message for the family.